LA-based non-profit organization using art and music to promote connection and wellness for houseless communities. So-Cal's resident gurus of media, clothing, and insane punk rock shows! Epic Eatz and El Cevichito Food Truck will be on site servin' up the goodness! Punk Rock Food Drive has raised over 152,000 meals since our first show in 2009. Seven great bands playing for their community. Punk Rock Food Drive has raised over 111,000 meals for San Diego County residents since 2009! Tattoos, Clothing, Restaurant & Brewery Gift Cards, Surf & Skate Gear, and MORE! Punk Rock Food Drive has raised over 91,000 meals for San Diego County residents since 2009! To everyone who came out to the Punk Rock Food Drive on Saturday! We had one of our best turnouts to date. Iron Fist Brewing Company was jumping and the staff were amazing! Such a great mix of bands playing to a lively and receptive audience. The coolest part about tallying up the results of a Punk Rock Food Drive event is that the numbers keep changing. Just yesterday we received a $100 online donation. That's 500 meals. 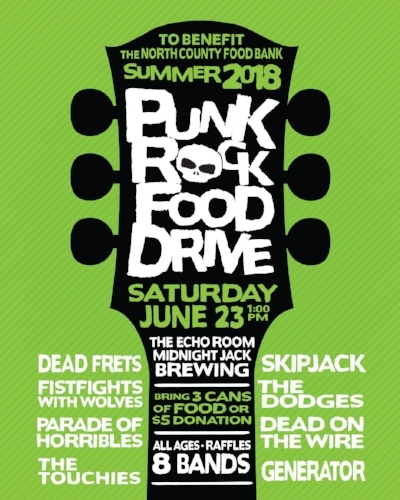 If you missed this year's event and want to keep knocking this number up, go to www.punkrockfood.com and click that "DONATE NOW" link. For now, thank you for all for raising over 17,000 meals! That is a staggering amount of food! Once again you've surpassed our previous drive efforts and made this our most successful event yet! We're more excited than ever. Our next PRFD will likely get us over some humbling milestones and we can't to wait to reach those with you in the future. Share food with friends and family, today and always. It takes so much preparation and work to get these events organized but things ran so smoothly. Really just a story-book outcome of what we'd hope to see. It seems like work going in but somewhere in the process it morphs into play. We're lucky to have you and to know you. Everyone who attends and donates makes such a bigger impact than we ever could on our own. 8th Annual Thanksgiving PRFD Announced! 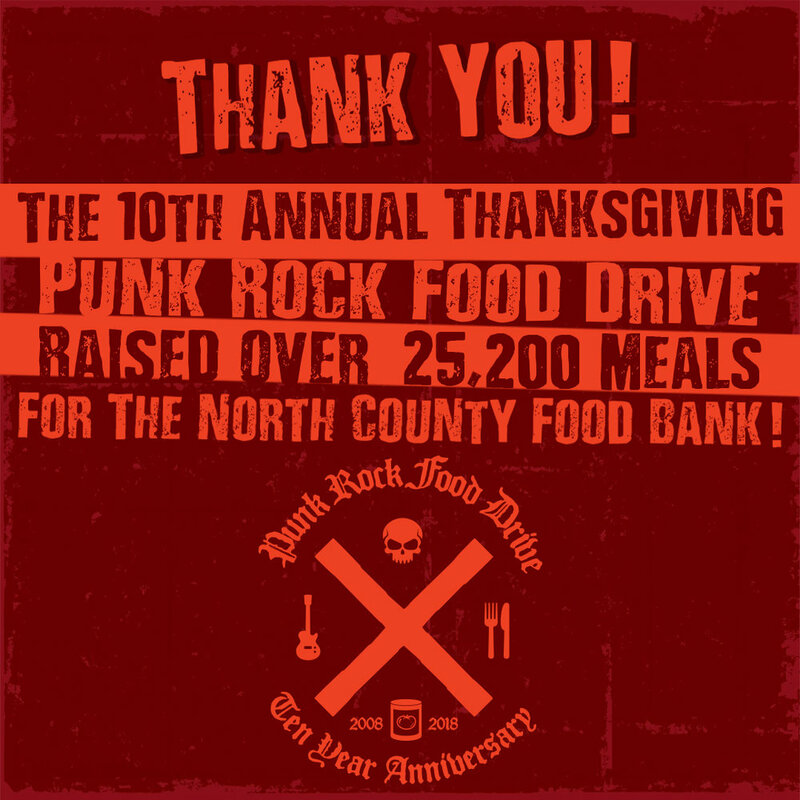 Punk Rock Food Drive has raised over 74 000 meals for San Diego County residents since 2009!